The Indian unit of Russian truck manufacturer Kamaz will export trucks assembled in the country to third countries, Chief Executive Sergey Kogogin said at a business forum on Tuesday. “At the moment, we are working on supplies of our vehicles from India to Myanmar and Bangladesh,” he said. The company has already carried out some supplies to African countries, he added. The localization of Kamaz’s Indian plant, which has a design capacity of 5,000 trucks per year, amounts to 80 percent. Kamaz is looking at India to become a base for the expansion of Russian trucks in Asia. Russian experts believe that choosing the country as a platform to launch the development of the Asian market is the strategically correct step. The Asian market is indispensable to Kamaz, since the Russian domestic market has not fared well over the last two years. 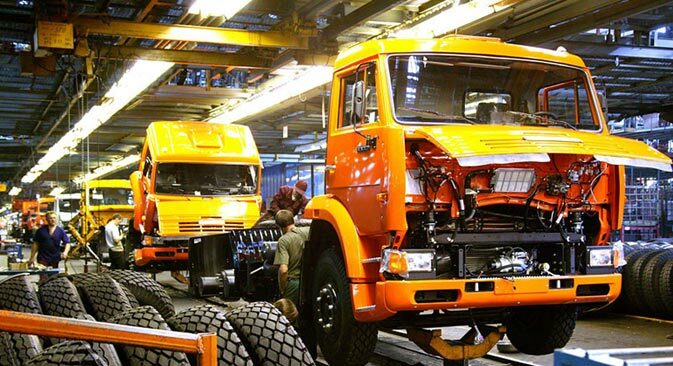 The political situation in Ukraine has also added to the truck maker’s woes. The plant in Hosur, near Bangalore, was launched in 2010 as a joint venture of Kamaz and India’s Vectra Group, with the Russian company holding a 51 percent stake. Earlier in 2014, Kamaz bought out a stake of its Indian partner in the plant, increasing its total interest to 100 percent. The plant is preparing several models of open-ended vehicles and construction trucks using the KamAZ-6540 chassis, as well as long-haul tractors. Analysts believe that there is a good amount of potential for Kamaz in the Indian market. Investcafe analyst Igor Arnautov told RIR earlier this year that, in the next 3 to 5 years, Kamaz intends to increase sales to 8,000-10,000 trucks per year, and to increase the Indian plant's sales to 2,000 trucks per year. India is currently the third largest market for trucks in Asia and is expected to overtake Japan in the next 5 years and trail just China. Kamaz faces stiff competition in India from the Tata Group.